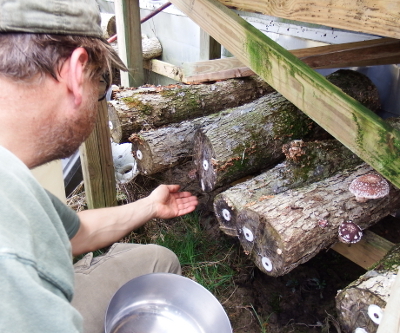 A year ago, Mark and I plugged oak logs with shiitake spawn. This is our second round of shiitakes, but our first logs didn't last as long as we thought they should have. So we put in a bit more effort, building the fungi a station up off the ground in a shady spot and watering them during droughts (or rather, when I remembered). 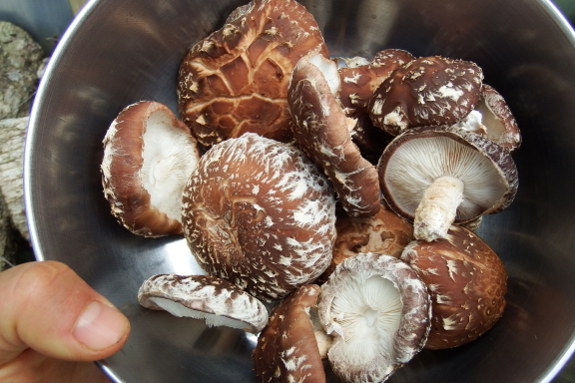 Fast forward ahead twelve months, and we harvested a bowlful of Native Harvest and Snow Cap mushrooms! There's about that many unexpanded buttons to be harvested later in the week too and many more to come in the years ahead. As a side note, the first miniature mushroom log to fruit is providing quite a good crop --- three medium-sized mushrooms. Mark and I both think these little logs would make great gifts for homesteaders to give suburbanite friends who have neither the space nor the energy levels to move larger logs around. The minis don't fruit any faster than the big logs (despite my hopes), but they do seem to produce a good-size crop in a very manageable package. The next question will be --- do minis last as long as the big logs? 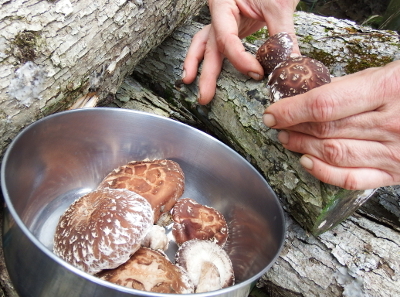 I'll end by sending you to my ebook Weekend Homesteader: March for step-by-step instructions about turning trees from your woodlot into easy edible fungi. Now's the time to plug logs, so best get crackin'! Sigh... Unfortunately, all the trees on my property that I could even begin to consider using as mushroom "dirt" are not suitable for mushroom growing. They're all the wrong species. I've even consulted with THE experts on this - FungiPerfecti and they agree. Maybe I'll just go with getting the inside mushroom packages they have.